Congenital lung lesions are a group of conditions where part of the lung has an abnormal growth or mass. The mass may be fluid filled or a solid mass. Congenital pulmonary airway malformation (CPAM), bronchopulmonary sequestration and congenital lobar emphysema are the most common types of congenital lung lesions. It can be hard to tell the difference between these types during pregnancy. The size of the lung mass can change over the course of pregnancy. Many of the lung lesions will grow, and appear to get bigger during the second trimester. It may push the heart over to the other side of the chest (called dextrocardia, or dextroposition). Fortunately, most lung lesions will begin to decrease in size during the second half of pregnancy, and do not cause any problems at birth. Survival for babies who have no symptoms at birth is excellent. Some babies may have some problems breathing after birth, and need more urgent evaluation and possible surgery. In about 10% of cases, the mass can be very large. A very large mass can cause poor lung growth (hypoplasia), and put extra pressure on the heart. This can sometimes lead to the buildup of extra fluid around the baby’s heart, lungs, and belly, as well as swelling of skin, called hydrops. Survival is very poor if the baby develops hydrops that does not respond to medicine. Even if hydrops does not develop, babies with very large lesions may have significant breathing problems at birth, and may require emergent surgery. Your high risk obstetrician will closely monitor your pregnancy for any signs of hydrops and other complications. The exact cause of congenital lung lesions is unknown. It is congenital, meaning that it happens before your baby is born. Other health issues do not commonly occur with this problem. A lung lesion may be found during routine prenatal ultrasound. If your doctor suspects a problem, additional tests may be ordered. (cardiologist) to look closely at your baby’s heart and surrounding blood vessels. • Fetal MRI (magnetic resonance imaging): This type of imaging gives more detailed pictures of your baby’s organs. It can provide additional information on the growth of the normal parts of the lungs, and can help identify if there is any extra blood supply to the lesion. • Cell-Free Fetal DNA testing: Your doctor can take a sample of your blood to look for copies of fetal (baby) DNA. This is only a screening test. A positive result means that there could be problems with the baby’s DNA. This should be confirmed with another test to be sure of the result. A normal result does not mean that there are no underlying genetic problems. Other testing can be done before or after birth depending on your needs and the needs of the baby. • Testing the baby: After birth, a test is done with a sample of your baby’s blood to look for chromosome problems. This is called either a “karyotype” (basic chromosome study), or microarray (a more detailed look at smaller pieces of DNA). If a test finds you are carrying a baby with congenital lung lesion, you will continue to receive care from your obstetrician. Your obstetrician may refer you to the Ohio Fetal Medicine Collaborative (OFMC), which will help you connect with a team of fetal medicine experts. There, you will meet with a multidisciplinary team including neonatologists (doctors who specialize in treating newborns), pediatric surgeons (doctors who perform surgery), and nurses to learn more about your baby’s care after he or she is born. Nurse coordinators will help answer your questions and concerns, guide you through your pregnancy, and prepare you for what to expect. Your doctor, jointly with a high risk maternal-fetal medicine doctor from the Ohio Fetal Medicine Collaborative, will watch your pregnancy closely. You may require frequent ultrasounds to monitor the size of the lung lesion, and to check for the development of hydrops (extra fluid buildup in the baby). Studies have showed that giving the mother a short course of steroids in the second trimester may help to prevent hydrops in fetuses with large lung lesions. Your maternal fetal medicine specialist will determine if steroids are needed based on the size of the lung mass and your baby’s measured chest volume. You may be able to deliver your baby at your local hospital. If there are concerns your baby may have symptoms at birth, you will need to deliver your baby at a hospital that is ready to care for high-risk babies like yours. In rare cases, it may be recommended that you deliver at a children’s hospital because the team thinks your baby is at high risk for needing urgent surgery. You should discuss your plans for labor and delivery with your obstetrician. Contact your doctor right away if you have any concerns. At the delivery hospital, a neonatologist (a doctor who specializes in treating newborns) will do an initial exam and assessment of your baby. The neonatologist will assess your baby’s breathing and heart rate, and examine the baby for other problems. • Your baby needs a chest x-ray at the delivery hospital before going home. The x-ray will check the lungs and make sure there is no need for early surgical evaluation. • If your baby is not having difficulty breathing then he/she will be discharged home with you and will follow up in the office with your surgeon. • Your baby will be scheduled for a CT scan and pediatric surgery clinic visit within 6 weeks of age. • The pediatric surgeon will decide when to do surgery, and which surgical approach would be best. It is important that the mass be surgically removed because of the risks of infection during later childhood. Also, there is the potential risk for cancer to develop in the lung later in life if it is not removed. Typically surgery takes place at about 4-6 months of age. The pediatric surgeon will evaluate to see if the lung mass can be removed using minimally invasive techniques. Surgery for congenital lung lesions can be performed using minimally invasive techniques (MIS). Pediatric surgeons are specially trained to use minimally invasive techniques whenever possible to reduce pain, length of hospital stays and the appearance of surgical scars. MIS is performed through small incisions using miniaturized surgical tools and cameras. • Most babies who come back for surgery when they are 4-6 months of age are able to have minimally invasive surgery. If your baby is sicker, and requires surgery shortly after birth, an open technique may be needed. – A chest tube may be placed to help drain fluid from the incision. • Your baby will briefly receive care in the delivery hospital’s neonatal intensive care unit (NICU). • A breathing tube will be placed if your baby is having difficulty breathing. • An intravenous line (IV) will be started in your baby’s arm, hand, foot scalp, or umbilical cord. The IV provides fluids and antibiotics to prevent dehydration and infection. • Your baby will be transferred to the Children’s Hospital NICU for further care. • Your baby will be evaluated to determine if the breathing problems are caused by the lung lesion, or due to another reason, such as infection or prematurity. • If the breathing problems are due to the lesion, it will need to be surgically removed by a pediatric surgeon. The surgery will occur shortly after birth and before hospital discharge. 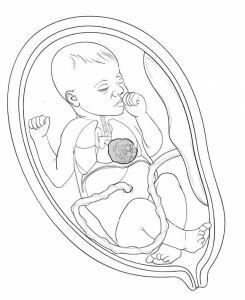 • If the lesion is moderate to large in size and the baby’s lungs are not working well enough to support the body, a special treatment called ECMO may be needed. This is a heart-lung bypass machine that allows the baby’s lungs to rest and heal for a short time. The doctors and nurses will talk to you about this if ECMO is needed. • Your baby will not be able to drink formula or breast milk until after he or she has recovered from surgery. Your baby may receive IV nutrition called TPN (total parenteral nutrition). TPN has all of the calories and nourishment needed for your baby to grow. Once your baby has been admitted to the Children’s Hospital NICU, the pediatric surgery team will evaluate your baby’s lungs and decide on which surgical approach would be best. The surgeon will remove the mass and the part of the lung that is affected by the mass. This can be done either by an open technique, using one larger incision, or by minimally invasive techniques. • A chest tube may be placed to help drain fluid from the incision. You will be able to take your baby home once he or she is breastfeeding well, or taking enough breast milk or formula by bottle to grow and gain weight. The total length of time your baby will stay in the hospital will vary. Your baby will need regular follow-up appointments to measure growth, development, and nutrition. You will want to find a local pediatrician to take care of routine checkups, immunizations, and doctor’s visits. The program coordinator can help you if needed. The pediatric surgeon will follow up with your baby’s surgical needs for as long as necessary.